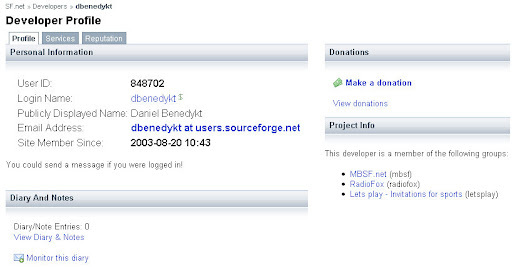 昨天收到 SourceForge.net 的通知信了, SourceForget.net Marketplace 正式開張. 在 Marketplace 上, 可以購買 services, 也可以提供 services. 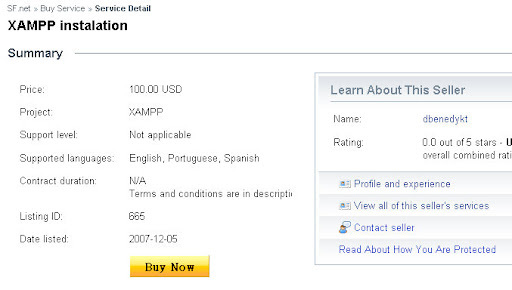 提供 services 的人不一定要是某 project 的維護者, 舉 XAMPP 為例, 目前提供的一個相關 service 是 XAMPP Instalation, 提供者 (seller) 並非原本在 S.F.net 上, XAMPP project 的維護者之一. 不知道這會不會引發在 S.F.net 上的 SEO 問題 : 我的 services 要怎樣比較容易讓需要的人找到呢 ? 同時可以察看該 seller 的 reputation 評分, 算是某種 customer feedback 的 service quality 紀錄. 但是此 quality 統計紀錄是針對 seller, 而非針對該 seller 的不同 services. 由於同一個 seller 對於不同的 services 能夠提供的服務品質可能有所不同, 因此我覺得如果可以同時提供該 seller 在不同 services 的表現會更好. 左下角有一個 detail 選項, 或許可以看到各次評分的詳細紀錄, 但是因為沒有找到已經有紀錄的 seller, 不知道下面的資訊會如何出現. 另外在 reputation 評分上, 也只有提供 excellent, good, satisfactory, fair, bad 等等模糊的評分, 而沒有辦法根據不同的 software services 有更細節的描述, 或許可以結合 ontology-based  的方式給予更有意義的評分. This entry was posted on 下午10:44 and is filed under open source , service oriented computing . You can follow any responses to this entry through the RSS 2.0 feed. You can leave a response, or trackback from your own site.